This heaithy young buck on top of a ridge standing proudly at full attention will be among the new pieces by Anita Jesse to be featured at Gallery 'N' Gifts for First Friday, April 5. Gallery 'N' Gifts is pleased to announce a new collection of work from artist Anita Jesse, who is known to many for her equine paintography. Jesse’s new collection, titled “All About Tehachapi,” features subject matter drawn from the landscapes and wildlife familiar to all who live in the Tehachapi valleys. 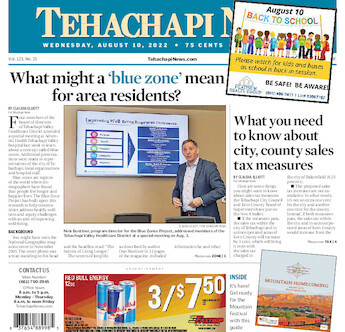 “All About Tehachapi” will be launched First Friday, at 5 p.m. April 5, at Gallery 'N' Gifts, 100 W. Tehachapi Blvd. Jesse has been represented by Gallery 'N' Gifts since her appearance as a featured guest artist in June 2012 when she introduced her “Celebrating the Horse” collection. Many fans of the gallery will remember that Jesse followed that by being a featured guest artist in June 2016 with her “Dreams of White Horses” collection. While Jesse’s latest work features a change in subject matter, her style is unmistakable. Through her paintography techniques, her fans will enjoy her unique vision applied to Tehachapi scenery and wildlife. “The beauty of the Tehachapi Valleys is irresistible and an inspiration for anyone creative," Jesse said. Jesse’s work can be viewed at her website, AnitaJesse.com. For more information, contact Anita Jesse at 821-1787 or Anita@AnitaJesse.com.